North Walsham, Warren House Press, 1977. FIRST EDITION (on rear endpaper: “Two hundred and fifty copies of this story have been printed for Warren House Press, of which 200 are for sale”). 8vo, pp. 28. 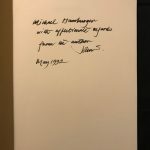 Author’s presentation copy dedicated to his friend scholar and poet Michael Hamburger, inscribed in black pen on the front endpaper: “Michael Hamburger / with affectionate regards / from the author / John S. / May 1992”. 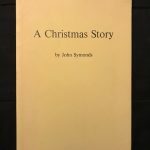 Bound in paper wrappers, title stamped on front cover and spine, with original dust jacket. A fine copy.